The owner would like to revamp her grandparents’ few decades old, single-storey dwelling into her own living spaces and studio. The requirements were to be spacious with a contemporary look and must be able to connect to the other house within the same compound where the rest of her family lives. However, the requirements did not match the existing footprint of the old house so there was a need to expand up to two storeys. The design team proposed to demolish the whole house keeping only the flooring structure and foundation and rebuilt with steel works to reduce dead loads imposing onto the old underground structure. Functionally, the new house is divided into two zones i.e. 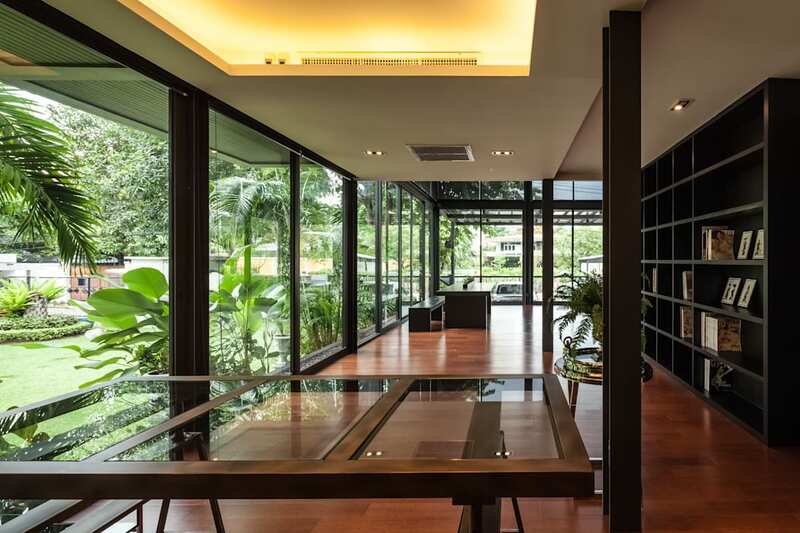 living and office spaces whereby the residential components, namely living, dining and kitchen on the first floor and master bedroom on the second floor, are tucked at the back for better privacy and connection to the other house. The studio takes up the front part of the house for the ease of access to the outside. Since the position and span of the old columns were not in a regular manner, the first floor is designed with open plan concept to keep it as spacious as possible, also perfectly fits for a house party. The studio part with its double-volume space is equipped with large glass openings maximizing the view to the central landscaped courtyard. The decorative approach of the interior is what we would like to call a ‘Loftuary’, a marriage of ‘Loft’ and ‘Luxury’ for which both styles are part of the owner’s wish list. The residential part features a warm colour palette and luxury choices of furniture and accessories with a slight touch of lofty look where appropriate. The studio, though not mistakenly for anything else other than loft, also has a small percentage of luxury in its aesthetical composition. Both styles, howbeit very distinctive in nature, can be brought together in harmony through countless attentive collaborations with the owner throughout the whole design and construction period. The architect’s full control of architectural and interior design and the owner’s hands-on involvement results in a comprehensive overall design that truly reflects the character of the owner, ‘feminine’ but ‘tough’, hence ‘luxury’ and ‘loft’.